Sexbombs, Golden Boys: Sexiest Men Ever by No Author Supplied, 9781610615679. « The Films of Fay Wray by Roy Kinnard, 9780786438754. 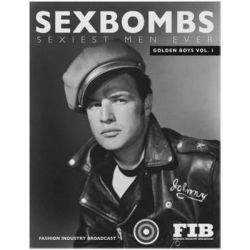 Informacje o Sexbombs, Golden Boys: Sexiest Men Ever by No Author Supplied, 9781610615679. Produkt został dodany 03.04.2014 19:34. Ostatnia zmiana danych produktu miała miejsce 03.04.2014 19:34.